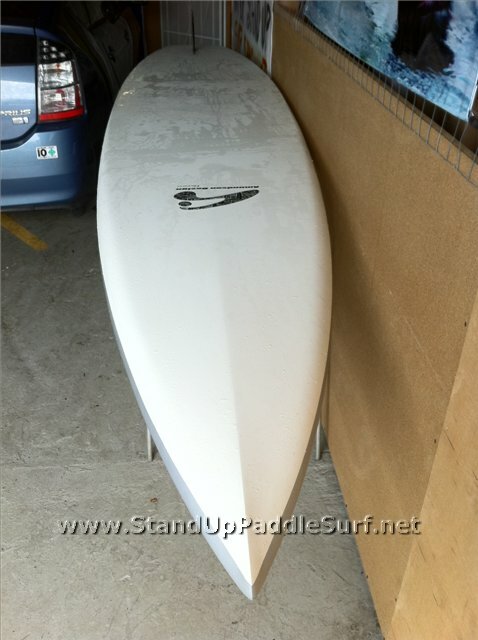 I visited Blue Planet Surf’s shop and Robert Stehlik suggested I try the Amundson 12′6″ stand up paddle board. He thought I might like it because it has enough volume to float 200+ lbs people comfortably and it surfs small waves really well and he was right. 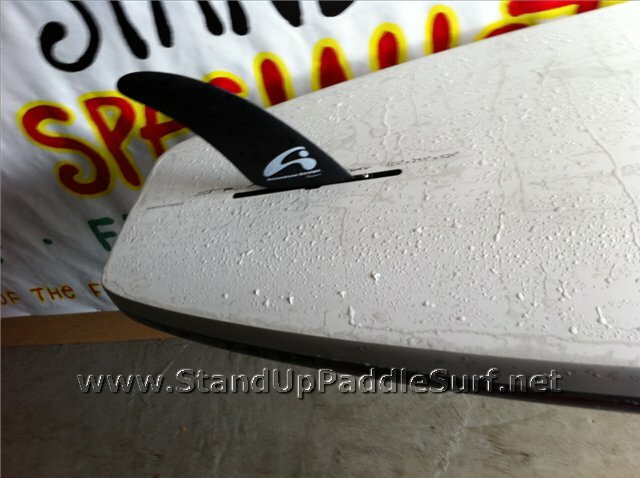 The board also has a displacement type nose so it has a nice glide and the rocker is low, making it perfect for small wave conditions. The tail is fairly wide and thick so it doesn’t sink too much when I step on it to turn. The wide tail helps for the stability and the sharp rails really help to turn the board no matter where you’re standing on it. The board is also fairly light. I demoed this board in small waves and light winds and really liked it. Robert mentioned that during the Battle of the Paddle Hawaii 2010, a couple of the racers were fighting over the board because they both really wanted to use it for the surf race. I can see how the board can be a good choice going in and out of small waves during a surf type race. It catches small bumps nicely and has a nice glide. I liked the hard rails which made this board really stable and easy to turn using the rail. The fun thing about this board is it can be used as an all-around board. It’s wide and stable enough so you can take your kid or your dog in the front. You can take some gear with you along with some food and paddle somewhere and go on a picnic, or just cruise down the coastline. This is my first experience with Amundson boards and I really like the 12′6″ for small wave, light wind type conditions. Here’s a PDF brochure of Amundson boards and other SUP products for more info. 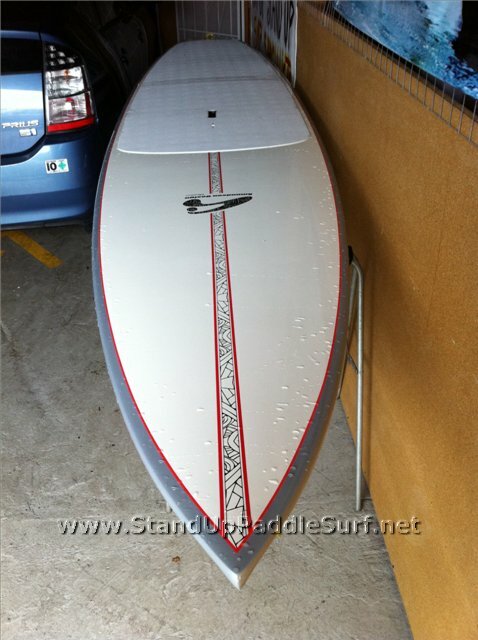 The new 12′6 Amundson SUP touring/race board is in stock now. It’s fast yet very stable and user friendly. It’s on sale in epoxy AST (TR model) construction for just $1299 and in carbon/kevlar construction (TR-X model is about 4 lbs lighter) for $1699. For a limited time Blue Planet Surf Shop is even throwing in a free paddle. 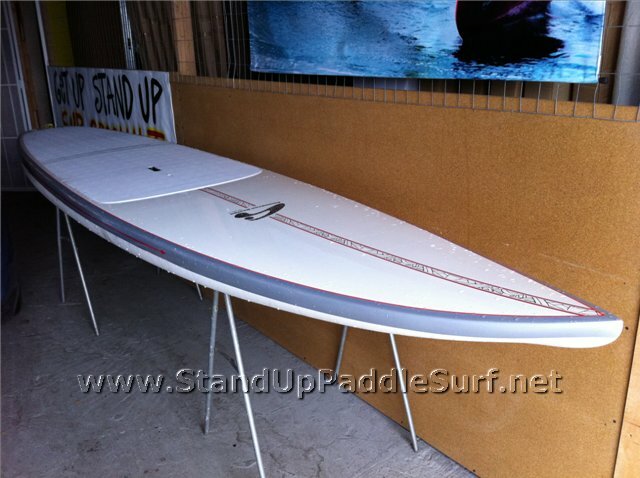 At $1299 for a board + paddle, I think it’s a good deal for someone looking into getting a 12′6″ SUP board. 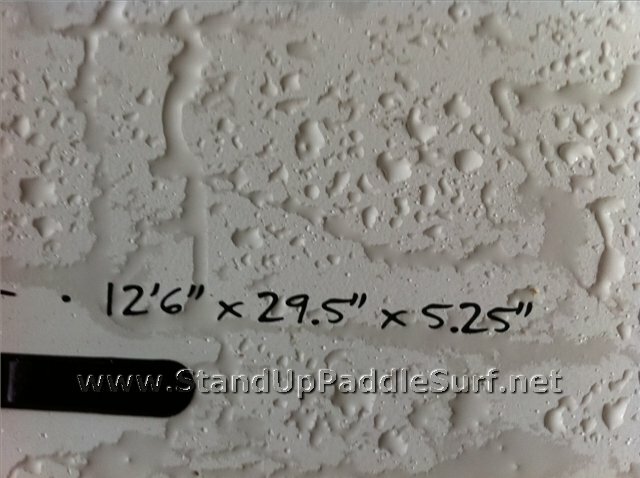 I typically don’t like to race 12′6″ SUP boards because I’m heavy (at over 200 lbs) and the 12′6″ boards I’ve ridden so far have enough volume to float me but they’re a lot of work for me in downwind conditions. It takes much more effort for me to ride a 12′6″ downwind than a 16′ or a 17′ SUP race board. I also like to have a rudder on my race boards. 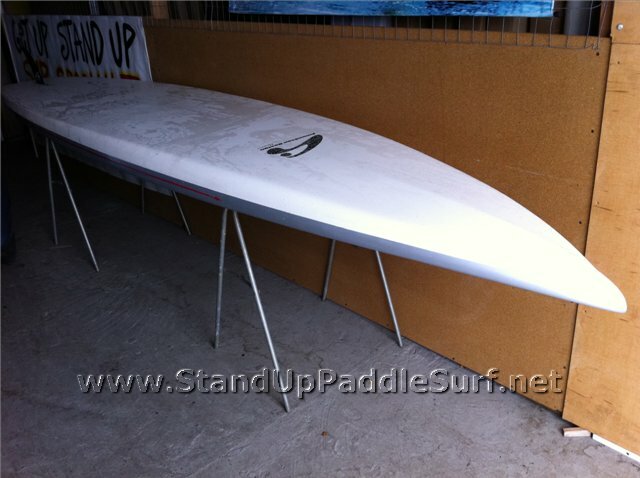 Having said that, I don’t think I’ve given the 12′6″ stand up paddle race boards a fair shake. This summer, the surf on the south shore wasn’t very good but it was pretty good for downwinders. There were a number of days where there was no wind or the wind was light and the waves were pretty small. Sometimes the wind was on-shore or going in the wrong direction which messed up the surf and wasn’t good for downwinders. Under these small wave conditions, you can ride a regular (9′ – 11′) stand up paddle surfboard but at my skill level, it’s more fun to SUP surf on a 12′6″ – 14′ . On a bigger board or a canoe (OC-1 or 4 man), you can catch these waves before it breaks and then stay with it and catch when it reforms or catch the little bumps at the end and get a really long ride. If you’re on a bigger board like a 14′ or 12′6″ SUP race board, it becomes really fun because you can see how far you can ride the wave and it’s more challenging to control a bigger board in the surf. Obviously we want to stay away from everybody else and we don’t want to get in their way but most of the time in small wave conditions like that, there are not a lot of people out because it’s just not that good for regular surfing. I’ve been having a blast on 12′6″ boards in that kind of small wave, light wind conditions this year. If I decide to test 12′6″ers on a downwinder, I’ll post something but until then, most of my testing for 12′6″ boards will be in the surf. Nice review, I have been looking for some reviews of this board. seems to be a lot of board for the price. Joe – Thanks for your comment. Your best bet is to demo these boards first if you have access to them. I think 300 lbs may be pushing the limit but I think it’ll float you. It may be pretty fun for your weight. 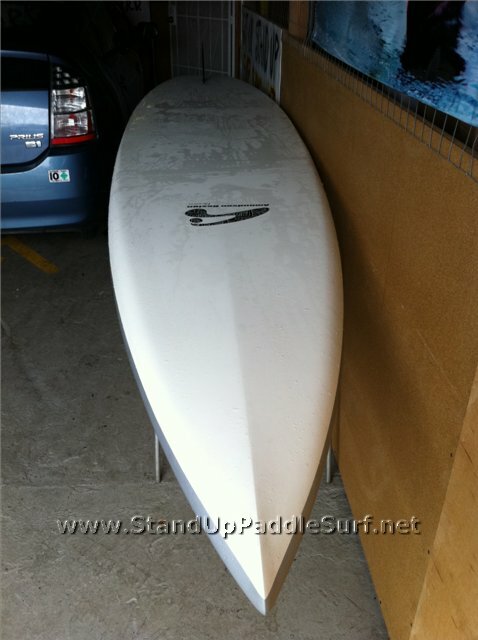 I know the Surftech 11′6″ softop will float you. I have another friend who is 300 lbs and surfs that one. The Starboard Avanti 11′2″ may also work as well as the 10′ Whopper. I’ve seen really big guys on those. Please excuse my ignorance, but how important is the length of the board for guys over 200 lbs? I’ve seen references above to boards 14 – 17 ft in length, but another for a board less than 11′ for a 300 lb. Paddler? Is there a more important parameter than length for 200-plus pound paddlers to consider? Johnny – I think volume is going to be important for guys over 200 lbs. This is especially true for a race board. Johnny – I am 225 lbs and surf with a 9′2″ PSH All Arounder. My bread and butter board is a 10′6″ PSH All Arounder. I have never tried a touring/race board; however, will rent one this weekend from Blue Planet and try out this Aquaglide 12′6″ TR. This entry is filed under Boards, Gear Reviews. You can follow any responses to this entry through RSS 2.0. You can skip to the end and leave a response. Pinging is currently not allowed.